S.A. Kruse et al / NeuroImage 39 (2008) 231-237 Conventional magnetic imaging gradients and radio frequency pulses that encode spatial positions are on the bottom left. The electromechanical actuator (a) applies vertical displacement to the object to be imaged via a cradle or (b) horizontal displacement via a bite block on the right. The cyclic motion-sensitizing gradients and the actuator are synchronized using trigger pulses provided by the imager. The phase offset angle (o) between the two can be varied to image the waves at various stages of the propagation. As shown by the shaded regions on the left, the motion-sensitizing gradients can be superimposed along any desired axis to detect the component of the cyclic motion vector. All data was collected and analysed using 100 Hz/ motion. The evolution of brain imaging is moving increasingly into the zone of robotic surgery at some point in time the surgeon will be moving his hand to control a robotic hand performing the surgery. Such exactness is especially critical in brain surgery. Imagine a doctor using a 3-D scan of a patient with the elastic nature of the tissue that he/she will be working on within the image, its the feedback of how the tissue actually feels. Its one of those basics of medicine that is part of the physical examination. As A doctor gains experience, he is guided by how elastic, how stiff, how any tissue behaves. The human hand is an exquisite measuring device in this regard, seeking out the differences that can mean a successful diagnosis at the early stage of change. So can modern imaging impose an elastic character onto a brain image set? Using magnetic resonance image data sets basically vibration patterns are sent into tissue like near the heart, near the lungs, near the liver, near the bladder and near the brain. Images are sensitive to waves of vibration entering and leaving the anatomy. I’ll be citing from Neurosurgery Review (2010) 33:137–145 on a review article entitled Magnetic Resonance elastography: a general overview of its current and future applications in brain imaging authored by Antonio Di Ieva, Fabio Grizzi, Elisa Rognone, Zion Tsz Ho Tse, Tassanai Parittotokkaporn, Ferdinando Rodriguez y Baena, Manfred Tschabitscher & Christian Matula, Siegfrid Trattnig, and Riccardo Rodriguez y Baena. the possibility of a kind of “palpation by imaging” When the authors use the term rheological they are referring to the behavior of how something moves, deforms, changing shape and flows. Look at that! Is that a coincidence, that the authors are describing behavior of shape? Lets move on. “Many studies have quantified shear modulus data in the brain under both physiological and pathological conditions, and propagating shear waves have been imaged and estimated using some specific sequences in volunteers. Xu et al. developed a modified phase-contrast gradient-echo sequence with motion-sensitizing gradients and clearly demonstrated a difference in the elasticity of grey and white matter using a 3-T MR unit, and various authors have found shear module data ranging from 2.5 to 15.2 kPa for white matter and from 2.8 to 12.9 kPa for grey matter. The data are generally consistent with the fact that cerebral white matter is significantly stiffer than grey matter in vivo ; however, Nagashima et al. assumed grey matter to be stiffer than white matter for a finite element of brain oedema and Green et al. found it was stiffer with MRE. This variability suggests that there is no definite method of confirming brain stiffness estimates in vivo, but there is clearly a difference in the elasticity of grey and white matter. Potential symptomatic changes in global brain viscoelasticity may be attributable to diffuse effects of neurodegenerative diseases such as Alzheimer’s disease and multiple sclerosis. Because of the small area of grey matter in comparison with shear wavelength and the difficulty in accurately determining shear wave velocity in different media, Hamhaber et al. considered a mean shear modulus of 3.5 kPa (averaging grey and white matter). Kruse et al. estimated the rapid attenuation of wave propagation toward the centre of the brain in 25 healthy adult volunteers, and the increasing wavelength of the travelling shear wave that indicates that it is traveling through increasingly stiffer media .” This last phrase is intriguing, are the authors saying the brain gets stiffer toward the middle? We have this concept that it is floating in the cerebral spinal fluid immersed yet when a wave is vibrated into the brain it responds as if traveling through something getting stiffer. The other interesting author’s observation is that the elastic nature of grey versus white matter is more measurable than the stiffness capacity. Now if you were to reexamine my primer essay on tensegrity, one of the main points stressed was how tension was felt all through the structure as the integrity of tension. With the MRE technique it forces a much more rigorous understanding on the very nature of the construction or architecture of brain tissue. It’s not about concluding that brain is softer than liver. The critical question becomes: what is the structure of the brain.? As I’ve been saying in previous essays, give tensegrity a chance. Brain is elastic that is a first observation, brain is bendable, brain behaves like viscous water, distorting around constraints like the tentorium cerebellii, which are the dura folding in on itself. As the authors have noted the highest deflection amplitude is adjacent to this membrane structure, which translated from Latin is tent of the cerebellum. Wikipedia gives a very methodical description of the tentorium cerebellii as, ” The tentorium cerebelli is an arched lamina, elevated in the middle, and inclining downward toward the circumference. It covers the superior surface of the cerebellum, and supports the occipital lobes of the brain. Its anterior border is free and concave, and bounds a large oval opening, the incisura tentorii, for the transmission of the cerebral peduncles. It is attached, behind, by its convex border, to the transverse ridges upon the inner surface of the occipital bone, and there encloses the transverse sinuses; in front, to the superior angle of the petrous part of the temporal bone on either side, enclosing the superior petrosal sinuses. 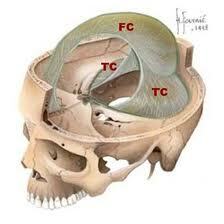 At the apex of the petrous part of the temporal bone the free and attached borders meet, and, crossing one another, are continued forward to be fixed to the anterior and posterior clinoid processes respectively. To the middle line of its upper surface the posterior border of the falx cerebri is attached, the straight sinus being placed at their line of junction. So as a vibration is sent into the brain with the highest shear measured values are adjacent to the tentorium cerebellii. If we are to ask the question: what does this really mean? Here’s what we might explain how to boost this imaging technology. The authors speculate along these kinds of thoughts. “Considering that the mechanical behavior of brain tissue is one of the most demanding and complicated to model, MRE could also improve biomedical engineering research as knowing more about the properties of the brain in order to develop materials which could aid our understanding of the mechanisms of concussion and other types of traumatic injury. The mechanical properties of brain tissue govern its deformation during an impact or rapid acceleration. 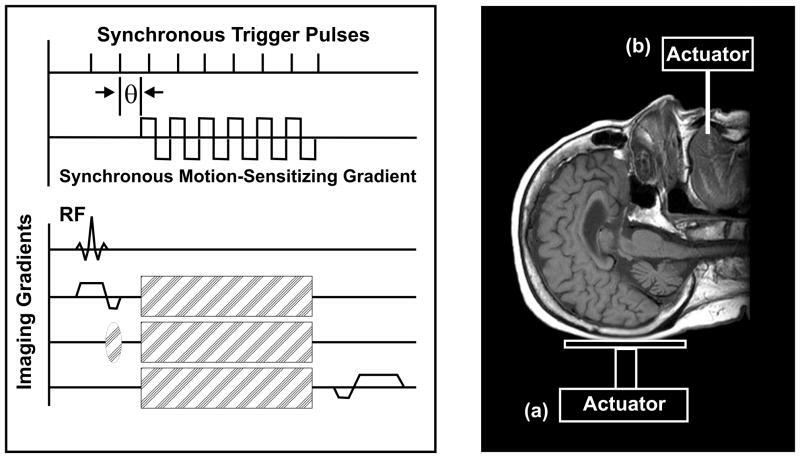 Margulies has developed an empirical correlation between critical shear strain and the onset of diffuse axonal injury in response to rotational inertial loading of the brain, and MRE could be useful in quantifying the necessary cut-off values. In addition, MRE could help in predicting the deformation of brain tissue during craniotomies or the insertion of needles and similar tools during routine neurosurgical procedures. In cadavers’ specimens, it could be studied how formalin fixation or other techniques used in the anatomic laboratories affect white or grey matter preferentially. Characterizing the mechanical properties of the developing brain is also important for understanding the nature of brain development. Van Essen et al. have postulated that tension in axonal fibers pulls the cerebral cortex together to create outward folds and, although it is not yet clear whether the levels of tension generated in axons are sufficiently large to deform brain tissue, this question can be addressed by learning more about both axonal tension and tissue stiffness. ” Learning more about tensegrity of the brain is what the authors may be saying. Where the vibration hits supporting structures, like the dural folds, acting as separating attachment zones, the wave pattern shear changes are detected. The images themselves are very fuzzy in terms of defined anatomical borders with MRE. Better models of the assembled brain structure should be simulated, perhaps tensegrity simulation? I dream there will be one day when the MRE brain image will be in sharp focus, less fuzzy, and then the remnant of a concussion brain deformation will now be felt in the image as a change of elastic viscosity.